To this day, Elvis Presley is probably the most iconic figure in American music history. From his truck driver hair style to his blue suede shoes, he took America by storm in 1954 and remained popular until his untimely death in 1977. Every generation enjoyed his music. Older people liked him because of his southern charm and good manners. The fact that he recorded 4 gospel LP’s during his lifetime endeared him to the more conservative folks as well. Younger people liked him because he seemed to understand them. There was a little bit of rebel there that made us dig him. His music had an appeal that spanned generations. Hey – that’s what it sounded like he was saying! It sounded like he was singing to ME! How dreamy is that? That great song was recorded on this day in 1956! 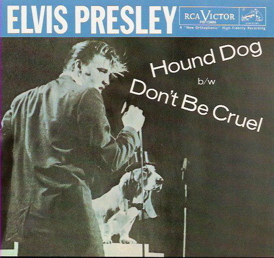 He also recorded “Hound Dog” on this day. Both songs were hits – but by 1956, that came as no surprise to anyone. There was just something about Elvis – he was driven when it came to music. Over his two-decade career, Elvis recorded over 700 songs for the RCA label. It’s thought, however, that there were other songs that never got recorded – which means that he probably knew and performed almost 1,000 songs!